12, 16 and 26 ounces sizes feature curved wall construction and faceted rings. 22 ounce size features straight wall construction, available with or without faceted rings. 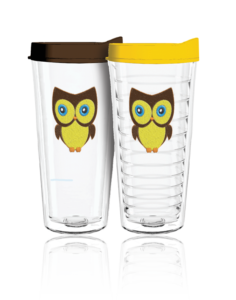 Top-rack dishwasher safe coffee mug features matching turn tab lid and handle combination. Made in the USA by Williams Plastics LLC, Tritan™ USA drinkware products feature a lifetime replacement guarantee and double wall insulation that ensure your cold drink stays cold and your hot drink stays hot. Safe for the microwave and top rack of your dishwasher, our tumblers are compatible with most car cup holders and remain free from condensation. 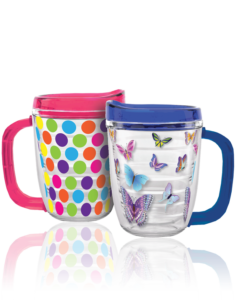 Tritan USA drinkware products are constructed from FDA-approved materials and are completely BPA-free. Be sure to check out our many customization options available on every size! Secure, snap fit lids are available in a variety of colors. Our Turn Tab lids are made of Tritan co-polyester material and have a clever turn tab mechanism to help reduce leaks and spills. Our TKO lids have a traditional thumb slide and are made of a polypropylene blend. Straws are offered in two sizes and come in a variety of colors to match the lids. 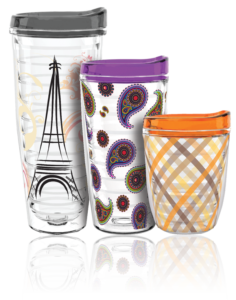 Please contact us for additional information on how to add Tritan USA drinkware to your product portfolio.